WEST LAFAYETTE, Ind. 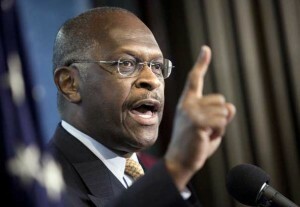 — Herman Cain, Purdue alumnus and potential Republican presidential candidate for 2012, will speak at Purdue on April 20. The talk, which is free and open to the public, is at 8:00p in the Class of 1950 Lecture Hall, said Michael Cunningham, president of Purdue College Republicans and a junior studying history. The event is organized by the Purdue College Republicans and co-sponsored by Purdue Student Government and Young America’s Foundation. Cain, who has formed an exploratory committee for the 2012 Republican presidential nomination, earned his master’s degree in computer science from Purdue in 1971 while working as a mathematician for the Department of Navy. He received an honorary doctorate from Purdue in 2004. His received an undergraduate degree in mathematics from Morehouse College in 1967. Cain is founder and CEO of T.H.E. Inc, a leadership and solutions company specializing in keynote speaking and publications on the topics of leadership, business and motivation. He is a businessman who was CEO and former chair of the Federal Reserve Bank in Kansas City, CEO and president of the National Restaurant Association, CEO and president of Godfather’s Pizza, vice president for Pillsbury Co., and business analyst for Coca-Cola Co. He also is host of the nationally syndicated radio program “The Herman Cain Show” and is a regular contributor on several broadcast networks.